One of my favorite barbecue and grilling books of all time is Peace, Love, and Barbecue, barbecue champion Mike Mills’s folksy tour of world class barbecue shacks and interviews with the legends of barbecue. Mills pried a few recipes from the brains of reluctant pitmasters, but one of the best recipes in the book was provided willingly by food writer and culinary consultant Elizabeth Karmel. It’s her Beer-Brined Smoked Catfish and it’s a great recipe for two reasons: It’s really easy to make and the catfish tastes great. You make a simple brine, soak the catfish overnight in the brine and smoke them the next day. Here’s the recipe for the brine. 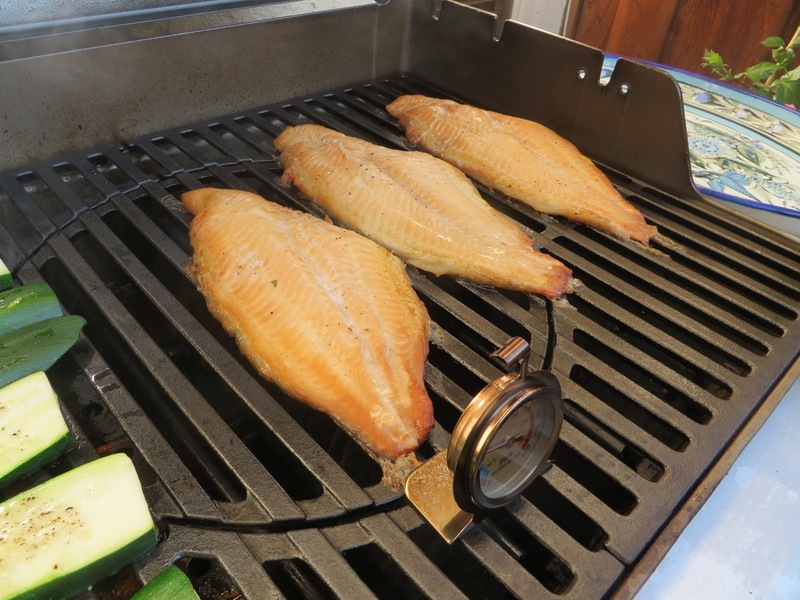 I smoked the fish on my Weber Spirit E-310 Grill using soaked pecan wood chips with a smoker box. Any mild wood like cherry, apple, alder, or peach would likely work. I’d steer clear of stronger woods like hickory, oak, or mesquite that might over power the fish. Actually, I’d steer clear of mesquite, period. But I digress. If I have any critique of Ms. Karmel’s recipe, it’s a tad too salty for my taste. You might want to cut back the salt in the brine to 3/4 or even 1/2 cup if you prefer less salt. Yes, fellow beer geeks, I use Budweiser in the brine. I suppose if you want to use a lager from your favorite local brewery, go right ahead. My guess is that you won’t be able to tell the difference. A light amber or Vienna Lager like Sam Adams might work here, but might thought is that dark or hoppy beer might start to overpower the delicate catfish. Enjoy and be careful. Ms. Karmel’s Beer Brined Smoked Catfish is pretty addictive.